Post-traumatic stress disorder, or PTSD, is a mental condition caused by a traumatic event. People with PTSD may experience intrusive memories, negative thoughts, anxiety and chronic pain. The condition is typically treated with a combination of psychotherapy, anti-depressants and anti-anxiety medications. It’s this connection between mental health and pain that interests Imanuel Lerman, MD, associate professor at University of California San Diego School of Medicine, Jacobs School of Engineering and Qualcomm Institute, and a pain management specialist at UC San Diego Health and Veterans Affairs San Diego Healthcare System. Lerman especially wants to know how the emotional pain experience may be influenced by the vagus nerve, which runs down both sides of our necks from the brainstem to the abdomen. The vagus nerve also plays a critical role in maintaining heart rate, breathing rate, digestive tract movement and many other basic body functions. In a study published February 13, 2019 in PLOS ONE, Lerman and colleagues tested noninvasive vagus nerve stimulation as a method for dampening the sensation of pain. “It’s thought that people with certain differences in how their bodies — their autonomic and sympathetic nervous systems — process pain may be more susceptible to PTSD,” Lerman said. “And so we wanted to know if we might be able to re-write this ‘mis-firing’ as a means to manage pain, especially for people with PTSD.” Lerman led the study with Alan N. Simmons, PhD, director of the fMRI Research Laboratory at Veterans Affairs San Diego Healthcare System and associate professor of psychiatry at UC San Diego School of Medicine. 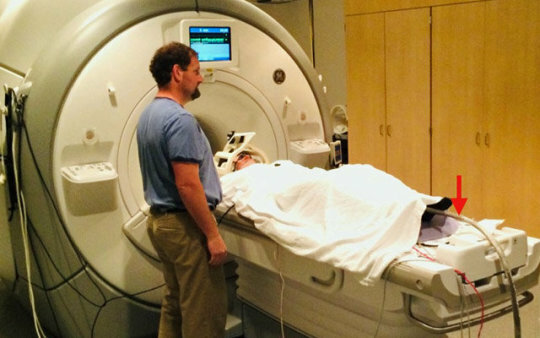 The team used functional magnetic resonance imaging (fMRI) to get a look at the brains of 30 healthy study participants after a painful heat stimulus was applied to their legs. To determine how the body’s sympathetic nervous system responds to pain, they also measured the sweat on the skin of participants before the heat was applied, and at several points as the heat increased. Half the participants were treated with noninvasive vagus nerve stimulation for two minutes — via electrodes placed on the neck — approximately 10 minutes before the heat stimulus. The other half received a mock stimulation. Lerman and colleagues report three main findings from this study. First, vagus nerve stimulation blunted peak response to heat stimulus in several areas of the brain known to be important for sensory and discriminative pain processing, as well as in emotional pain centers. The treatment also delayed the pain response in these brain regions — pain-related brain regions were activated ten seconds later in participants pre-treated with vagus nerve stimulation than in sham-treated participants. Second, the sweat measurements revealed that vagus nerve stimulation altered autonomic responses to painful heat stimulus. For participants pre-treated with vagus nerve stimulation, the sweat response decreased over time, in contrast to the sham-treatment group. Third, vagus nerve stimulation dampened the usual brainstem centers critical for the fight-or-flight-type responses, which are also known to control the sweat response to pain. Next, Lerman and colleagues will launch a Veterans Affairs Healthcare System-funded clinical trial in San Diego with military veterans, with and without PTSD. They want to determine if at-home vagus nerve stimulation can reduce emotional pain and underlying neural inflammation associated with PTSD. To learn how to participate, please call 858-552-8585. Vagus nerve stimulation is a form of neuromodulation, an approach to pain management that also includes spinal cord and dorsal root ganglion (DRG) stimulation. The U.S. Food and Drug Administration (FDA) has approved noninvasive vagus nerve stimulator for the treatment of episodic and chronic cluster headache and acute migraine, as well as an implantable device for epilepsy. An implanted vagus nerve stimulator is now being tested in a clinical trial for the treatment of rheumatoid arthritis. Side effects of implanted vagus nerve stimulation can include hoarseness, shortness of breath and nausea.